What a weekend! Between the two Pottery Barn quilting trunk shows on Saturday, my son's 5th birthday party on Sunday (at Chuck E Cheese's no less), and daylight savings time, I'm pretty much running on fumes. But oh, what a great time we had on Saturday. I thought I'd share some photos from the trunk shows. I didn't bring my "real" camera, just my iPhone. I thought it'd just be too hard to manage keeping track of the good camera - and that was the right call because we were busy - but I do wish I had brought someone with me to take nice photos. Live and learn! When we arrived at Pottery Barn in Naperville, this sign was out front with balloons! Really exciting! We met the store manager who was just exceptionally nice and welcoming, it really put my nerves at ease! We decided that we'd have more room to set up on the second floor and brought all our things up. There were these awesome railings that overlooked to the first floor. 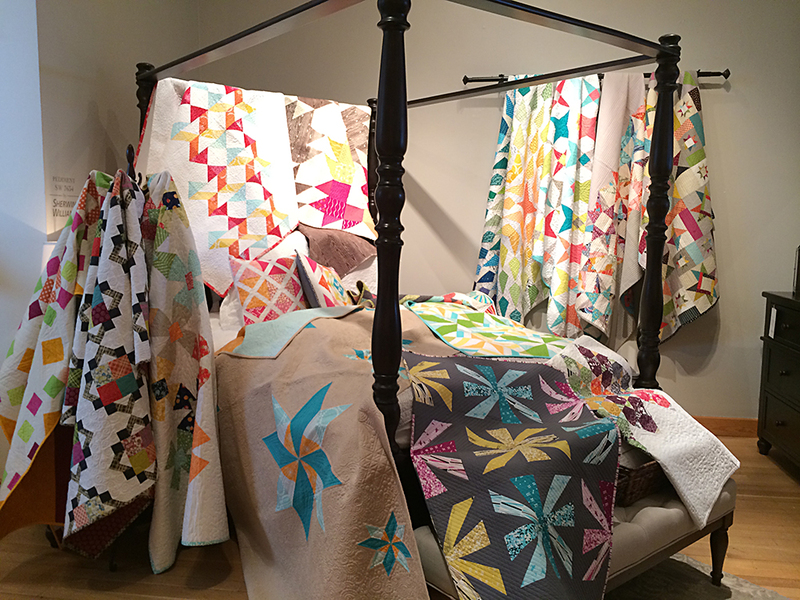 We were able to drape all our quilts on them - you could see them from below as soon as you walked into the store. We treated the event as a meet and greet. It was so much fun to talk to everyone one on one, answer questions, let people come and touch the quilts. Lots of quilters visited, some planned and some just happened to be in the store without knowing about the event. We met people from all experience levels - from expert long armers to women who sewed but were looking to learn to quilt. The hour flew by - it was just such a great time! We packed up the quilts, loaded up the car, and drove to the Oakbrook Pottery Barn to set up for round two. This store was one floor (so no railing) and really long with different nooks and sectioned off areas. We were placed in a side bedding area, so deciding how to display the quilts was harder. But luckily they had a Visual Stylist (fancy!) who came over to help us. He was an expert quilt hanger. 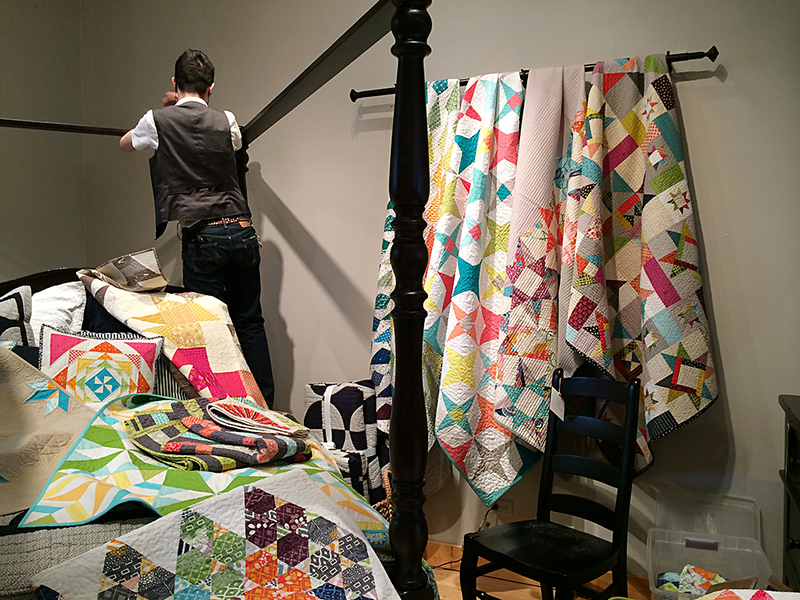 If anyone is looking to display quilts like this at home, it was really a great set up. They had installed a nice, solid curtain rod. The stylist took the quilt by the corner and folded that over the back of the curtain rod. Then he used super heavy duty clamps to clamp the corner to the back of the draped quilt. I am guessing you could get the clamps at a hardware store. Lee had a hard time even opening them when we took stuff down, so they were pretty strong. We also hung some quilts on a coat rack! We met even more quilters at this stop, and again we were able to talk to everyone one on one. I know I've gushed this entire post, but I really can't stress enough how fun it was to get to share our quilts with a new audience and in this setting. And look, they let us each take home a sign! You better believe that's now hanging up in my sewing room. I just want to thank everyone who came out to visit as well as Pottery Barn for inviting us to share our quilts at their shops. We have 2 more trunk shows planned - Lee and I in the Milwaukee area and Katie in Arlington, VA on March 22nd. If you happen to live around those cities, I hope you will come!